Prominent Tesla Inc. short seller David Einhorn thinks the third quarter was the high-water mark for the electric-car maker, because sales of pricier Model 3 sedans will wane going forward. Tesla blew away Wall Street’s expectations by reporting just the third profitable quarter in its history last month. The company delivered more than 56,000 Model 3s to customers, and the average selling price approached $60,000. Chief Executive Officer Elon Musk has said he expects Tesla to report positive net income and free cash flow from now on. To deliver on that prediction, he’ll have to count on strong demand for long-range battery and higher-performance versions of the car that can reach $70,000 when loaded with options such as an enhanced Autopilot system. Musk, 47, has yet to produce a long-promised version of the Model 3 with a $35,000 starting price. In May, he tweeted that Tesla would “lose money & die” if it shipped the cheapest iteration of the car before achieving higher production levels. 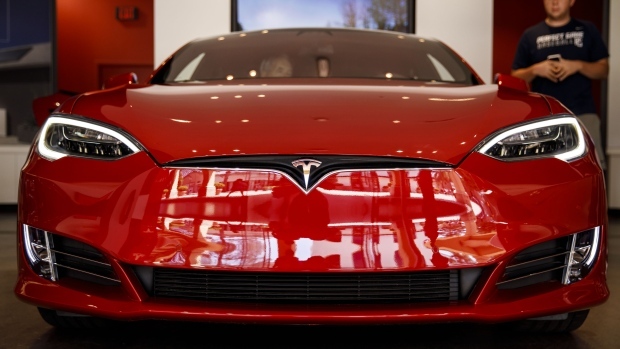 Tesla shares rose as much as 1.9 percent Tuesday and were up 1.3 percent to $345.93 as of 10:55 a.m. in New York. Other challenges ahead for Tesla include the arrival of electric vehicles from the likes of Audi, Porsche, Mercedes-Benz and Jaguar. The company also has disclosed that the Securities and Exchange Commission and Justice Department have sought information regarding public statements that Musk made last year related to Model 3 production that ended up being overly optimistic. “Tesla is contending with a litany of competitive, regulatory, human-resources, vehicle-quality and capital-structure issues,” Einhorn, 49, said Tuesday.